Twelve miles south of Mulege, Baja California Sur, Mexico, located within a vast pristine, natural marine setting, Posada Concepcion is a special gated community of active retirees. White sand beaches...located on a bay within the world renowned Concepcion Bay... a Jacques Cousteau favorite. All located on the Sea of Cortez in warm, tranquil waters. Favorite activities here at Posada are water related. Sailing, fishing, snorkeling, diving, and kayaking head the list and are located right at your doorstep. Three natural, thermal hot springs on the property! Our tennis court is top notch, wonderful mountain hiking, and bocce ball are big here. "Our little beach town" features 64 homes, a community center palapa, boat launch and moorage, all in harmony with nature and protected by 24 hour security. We are a green community and support recycling and composting efforts as a group. The local beach areas have cantinas and restaurants within a few miles drive. The town of Mulege has shopping and dining facilities as well as a bank with ATM. The international airport in Loreto is a mere 70 mile drive. So, If you have ever dreamed of retiring on an exotic beach...here is your chance! RV sites with full hookups. 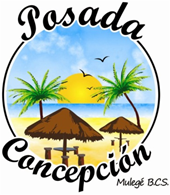 Come for a visit and fall in love with Posada Concepcion! Take a quick video tour of Posada!